I have been a fan of Golden Baobab and what they are doing for children's literature ever since I first learned about them in 2012. The Golden Baobab Prizes for literature, organised by Golden Baobab - a Ghana-based pan African social enterprise dedicated to supporting African writers and illustrators to create winning African children’s book - were established in July 2008 to inspire the creation of enthralling African children’s stories by African writers. The Prizes invite entries of unpublished stories written by African citizens irrespective of age, race, or country of origin. 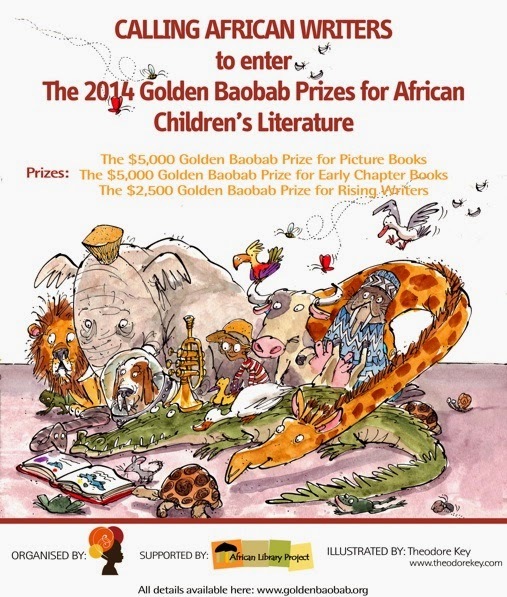 The prizes have recently expanded to include The Golden Baobab Prizes for Illustrations to discover, nurture and celebrate African illustrators of children’s stories. Well, on Thursday 11th September, the Golden Baobab Prizes for African children’s literature announced the 14 stories that made it onto their longlist for 2014. And for the second year in a row I had the opportunity to be on the Reading Panel and read some of the amazing stories that were submitted in the Early Book Chapter category. The process took around 6 weeks and each week 4 stories were sent, which were read and scored anonymously (there is no prior knowledge of who the writer is behind the stories). It's great to see that two of the stories I really enjoyed reading made it onto the longlist - the first by Mary Okon Ononokpono, described as a 'writer and a visual and music artist' and the other comes from Egyptian Dina Mousa. Also on the longlist for the Early Chapter Book Prize are Jayne Bauling (South Africa), who had a short story shortlisted for the Golden Baobab Prize in 2009 and has written YA novels as well as romance novels for Harlequin Mills & Boons, and Bontle Senne (South Africa), who is 'a blogger/content editor/literary activist'. These stories, which showcase some of the finest African writers and African children’s stories today, were selected from 210 stories which were received from 13 countries across the continent.With four writers each, Ghana and South Africa are the four most represented nationalities on the longlist. Other countries that had writers on the list were Egypt, Kenya, Zimbabwe and Nigeria. The longlist represents stories submitted to the Golden Baobab Prize for Picture Books and the Golden Baobab Prize for Early Chapter Books. No story from the Golden Baobab Prize for Rising Writers made it onto the 2014 longlist. 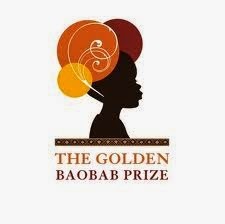 Now in its sixth year, the Golden Baobab Prizes inspire the creation of enthralling African children’s stories by African writers. To date, the prizes have received nearly 2000 stories from all over Africa. In 2013, to increase its support of the African children’s literature industry, the organization, Golden Baobab, introduced the brand new the Golden Baobab Prizes for African Illustrators. This prize will complement Golden Baobab's efforts in literature by discovering and celebrating Africa’s most exciting artists and illustrators who are creating images to tell stories to children.